It’s officially summer and you know what that means? Ice cream! 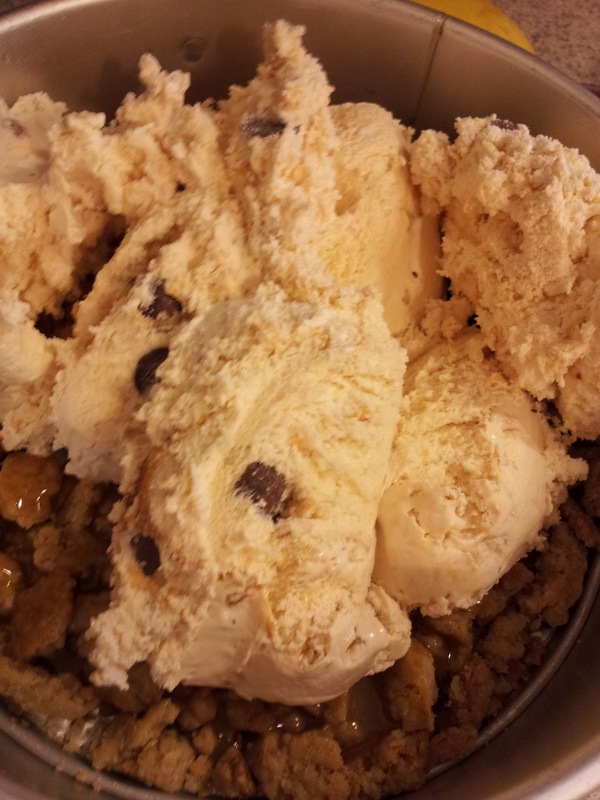 We had a pie and ice cream fellowship at church Sunday night and at the first mention I knew what I’d make. This is an old Southern Living recipe, not for homemade ice cream, but an ice cream dessert- specifically – Caramel Ice Cream Dessert. This is all about Oatmeal “cookie-like” crumbs, homemade caramel sauce and ice cream layered in a springform pan. Mmmhmmm. This is deliciousness! Here’s the bubbly caramel sauce cooking away while the cookie crumbs are baking in the oven. 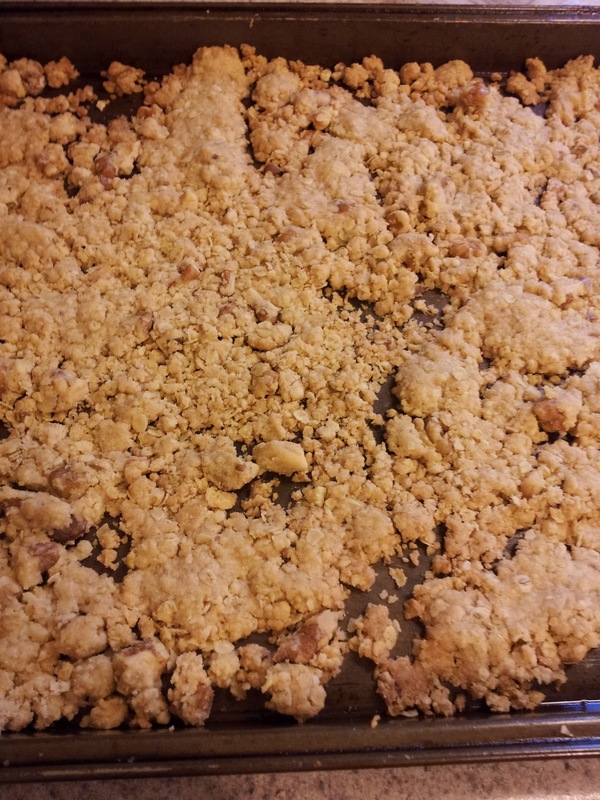 The cookie dough is spread into a baking pan, then broken into crumbly pieces to form the layers of the dessert. It then gets topped with the other half of the caramel sauce before getting put back into the freezer to harden up. Pop off the springform pan and serve. Don’t worry about it melting, it won’t last long! Combine first 4 ingredients, and stir in melted butter; press mixture firmly into a lightly greased 15 x 10 x 1″ jelly roll pan. Bake at 350 for 12 minutes, or until lightly browned; remove cookie to wire rack. Cool and crumble. 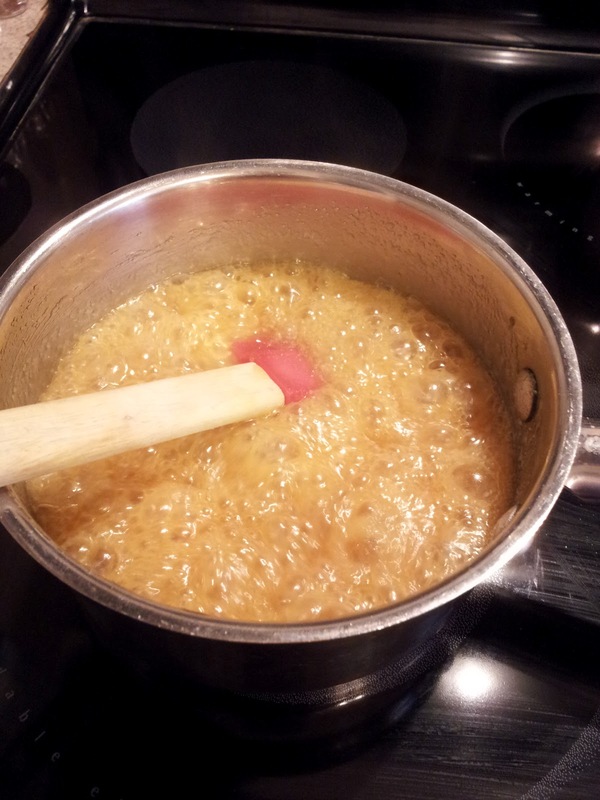 Combine 1 cup brown sugar, 1/2 cup butter, and evaporated milk in a heavy saucepan. Bring to a boil over medium heat, stirring constantly; boil 3 minutes. Cool caramel sauce. Sprinkle half of crumbs into bottom of lightly greased 10 inch springform pan. I think the next time I make this I will cover the bottom of the pan with waxed paper, then spray it with cooking spray before adding the cookie crumbs. Drizzle with half of caramel sauce. Spread remaining caramel sauce; sprinkle with remaining crumbs. 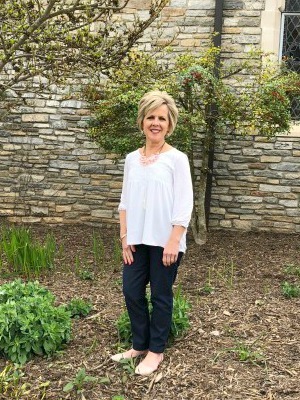 I was in the mood for new recipes this past week and went to my favorite and most reliable source – my old Southern Living cookbooks. You just can’t go wrong with their recipes! 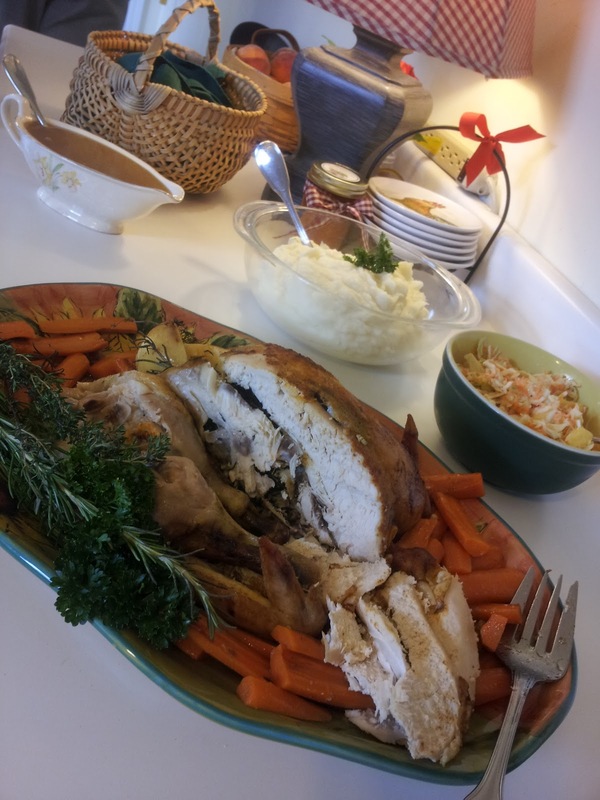 Sunday dinner was a favorite menu for our family and one I’ve shared here, but with an addition of a new side dish – the one from SL. This Pineapple-Almond slaw was really good. What a yummy addition to a summer meal! The sweet pineapple is a great combination with the slaw. I had purchased a fresh pineapple from Sam’s and used it instead of the canned pineapple. Combine first 6 ingredients in a small bowl; set aside. 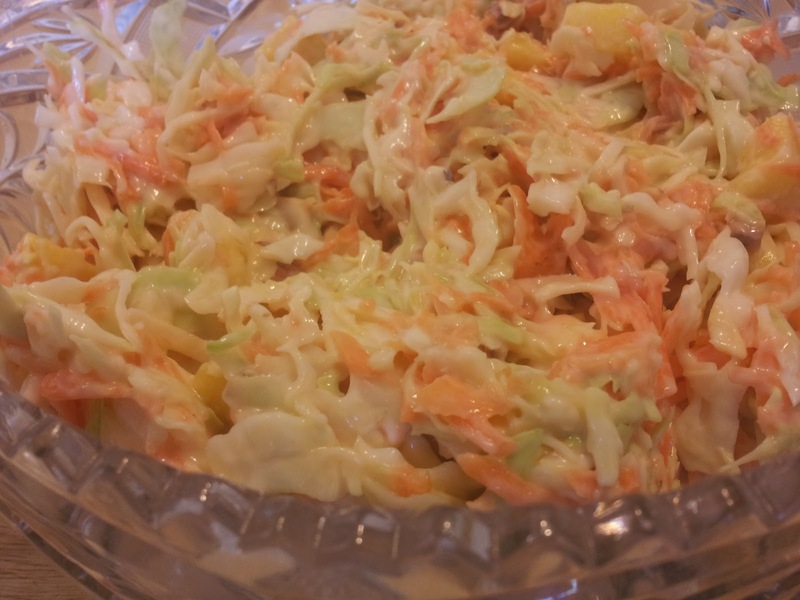 Combine cabbage and remaining ingredients in a large bowl; add sour cream mixture; tossing well. cover and chill thoroughly. Yield 8 to 10 servings. What new things have you stirred up in your kitchen? I made brunch after church yesterday – that in itself was a nice change since we rarely are both home to eat breakfast together. I made the German pancakes you posted last week, along with a new egg dish, bacon and fresh fruit. Yum! Brunch on Sunday is a great idea, Whitney! Sounds good!